A long time ago my dream was to be a pianist. Things change in your mind and in your heart, but it happens that the original idea shifts and changes without being completely lost. I found a video of an artist playing a piano with hammers instead of fingers beautiful, I heard about another artist swearing she would kill anyone harming a piano and I think that one of the best looking albums on my shelves shows a ruined piano standing on its side. I don’t think it’s the destruction that I find so appealing. That’s stupid. I think it’s a powerful and moving symbol. There is a video by the artist Douglas Gordon, where you see a piano burning in a beautiful green field. The name of that video is ‘The end of civilization”, and instinctively it’s a fitting name, maybe to envious people who do not know how to communicate with this being. 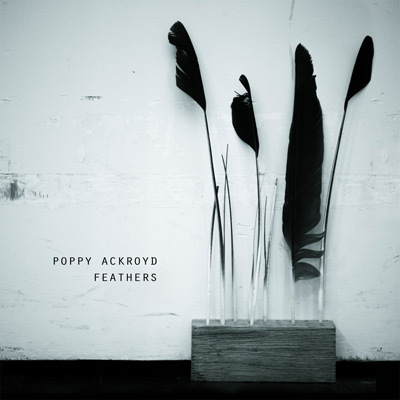 Poppy Ackroyd’s “Feathers” not something I would regularly write about in here, but at this time, the wondrous conversation with this delicate wooden beast is a remarkable documentation. The piano is not alone in this album. It’s accompanied by different kinds of keyboards, as well as violin, together forming a brittle, sincere and quite marvelous, frankly, creation. While listening to the title track I can only imagine that piano being played, as fingers are running on it back and forth. ‘Birdwoman’ begins with a fragile performance of a dreamy piano over sharp violin vibrations, only to explode into a moving, brilliant epos. Poppy Ackroyd’s album is refreshing, exciting and versatile, and while this is not the kind of album that I keep on my shelves, I have stopped and went to check her tour dates, as I feel I have to see this happens live. But in such beautiful correlation with the sleepy tragedy that her music projects, I find the upcoming shows oh so far from where I live. Well – There’s always this mood. Always.